During a meeting that Messiah Yeshua had with some of his disciples, shortly before his sacrificial death in 33 AD, they put the question to him: "What will be the sign of your presence [parousia] and the completion of the age?" Who really is the faithful and discreet slave whom his master appointed over his domestics, to give them their food in due season? Happy is that slave if his master finds him doing so when he arrives! Verily I say unto you, he will appoint him over all his belongings. It shall be in the latter days that the mountain of the house of YHWH shall be established as the highest of the mountains, exalted above the hills, where all nations shall flow. Many peoples shall go and say, Come, let us go up to the mountain of YHWH, to the house of the God of Jacob. Then he will teach us about his ways, and we will walk in his paths. For out of Zion shall go forth law, and the word of YHWH from Jerusalem ...House of Jacob [the slave], come, let us walk in the light of YHWH. In particular from Chapter 40, Isaiah is continuously making mention -in prophetic language - of the restoration of Israel and in conjunction therewith the prophetic appointment of the "Servant of Yahweh", often referred to by God as "My servant." One of his features making that Servant special is the fact that the Messiah also is included in the term and that even in the first place. Actually, not at all illogical. Why? Because Yeshua, by birth, also became part of national Israel, but as the Messiah, he became the most prominent member of that Servant Nation. Looking back on his incarnation, Paul noted that Yeshua took the form of a Slave, or a Servant shape: He emptied himself and took a slave’s form and came to be in the likeness of man! (Fp 2:7). Upon further investigation, it is clear that Yeshua, in his role as the Messiah, is the real Self of Israel, especially of the faithful part of the nation, an always reappearing Rest or Remnant. The result is that the Servant Prophecies may refer either to the future activities of the Remnant, or to the effects of Yeshua's ministry; with emphasis either (almost) exclusively on the nation, or on Messiah’s performances. In this respect, it is good pointing out further that it is really unthinkable for YHWH Elohim to finally reject Israel as his chosen people. That is utterly impossible, because in that case he would be obliged to reject the main member of the nation, the Messiah, as well; and such action is of course totally excluded. But you, Israel, my servant, Jacob whom I have chosen, the seed of Abraham my friend, you whom I have taken hold of from the ends of the earth, and called from the corners of it, and said to you, You are my servant, I have chosen you and not cast you away. Don’t you be afraid, for I am with you; do not be dismayed, for I am your God; I will strengthen you; yes, I will help you; yes, I will uphold you with the right hand of my righteousness. Behold, all those who are incensed against you shall be disappointed and confounded: those who strive with you shall be as nothing, and shall perish. The double name Jacob-Israel is characteristic in Isaiah 40-66, the second part of the Book, by some referred to as Second Isaiah, assuming that there would be a second Isaiah figure, a presupposition that lacks a solid basis. Jacob-Israel characterizes the relationship between Yahweh and his chosen people, the seed of Abraham, but also seed of Jacob; a powerful reference therefore to the patriarchs. It too is the basis for the Ebed YHWH position. Both for Israel and for her principal representative, the Messiah: In your seed all the Goyim of the earth will be blessed (Gen 22:18). And also, as was explained by Yeshua himself: Salvation is out of the Jews (John 4:22). The mention of Abraham fits well in the context, since the calling from the ends of the earth refers concretely to the call of Abraham, first from Ur and later from Charan. Israel’s election and her calling as YHWH’s Ebed, thus acquires historical depth. In Romans 11:28-29 the apostle divinely ascertains: Concerning the election, they are beloved for the fathers’ sake. For the gifts and the calling of God are irrevocable. Behold, my servant, whom I uphold; my chosen, in whom my soul delights: I have put my spirit on him; he will bring forth justice to the Gentiles. He will not cry, nor lift up his voice, nor cause it to be heard in the street. A bruised reed will he not break, and a dimly burning wick will he not quench: he will bring forth justice in truth. He will not fail nor be discouraged, until he have set justice in the earth; and the islands shall wait for his law. For to us a child is born. To us a son is given; and the government will be on his shoulders. His name will be called Wonderful, Counselor, Mighty god, Everlasting father, Prince of peace. Of the increase of his government and of peace there shall be no end, on the throne of David, and on his kingdom, to establish it, to uphold it with justice and with righteousness from that time on, even forever. The zeal of Yahweh of Armies will perform this. Therefore, the prophecy in Mt 12:18-21 was applied by the evangelist to the Principal one among all Israel, the Messiah. In the First Century, he laid the foundation for the establishment of that New order. No wonder that in due time, at the appearance of the Ebed, the Jewish Remnant of the last days, the Devil will bring about on its members such a great tribulation as never was since there was a nation even to that same time: and at that time your people shall be delivered, everyone who shall be found written in the book (Daniel 12:1). But if that evil servant should say in his heart, ‘My lord is delaying his coming,’ and begins to beat his fellow-servants, and eat and drink with the drunken, the lord of that servant will come in a day when he doesn’t expect it, and in an hour when he doesn’t know it, and will cut him in pieces, and appoint his portion with the hypocrites; there is where the weeping and grinding of teeth will be (Matthew 24:48-51). That unfaithful part of Israel - that evil servant – was also foreseen by Isaiah and the punishment by their Lord as well. In 66:5 he describes them prophetically as your brothers who hate you and exclude you [the faithful minority]. Clinging to their Messiah of their own choice, the Antichrist, they are too happy to support that tyrant in suppressing the Remnant. However, that contemptible action will bring no blessing to these enemies. In their own supposed 'sanctuary' Elohim will recompense their apostasy against him with the vengeance that is pictured in Isaiah 66:6 >> A sound from the temple! The sound of YHWH, rendering recompense to his enemies! It is certainly no coincidence that Isaiah the outcome for that evil slave captured in verse 66:6 of his book, the number 666 after all being the 'number' of that Anti-christian power, the Beast of Revelation 13. However, for the sake of the faithful ones among Israel, the days of that Great tribulation – Jacob’s trouble as mentioned in Jeremiah 30:7 - will be shortened. That faithful and discreet Ebed on earth will not be destroyed, nor bruised [quoting Yeshua’s own words]. It is actual impossible for YHWH Elohim allowing that happen! Why not? Otherwise no flesh would be saved; but for the sake of the chosen ones, those days will be shortened (Matth 24:22). Hear, you deaf; and look, you blind, that you may see. Who is blind, but my servant? or deaf, as my messenger whom I send? Who is blind as he who is at peace, and blind as Yahweh’s servant? You see many things, but do not observe. His ears are open, but he does not hear. This concerns nothing less than a sharp indictment of the Ebed nation. Certainly a striking transition in Isaiah, chapter 42. Elohim accuses Israel. As his chosen people, she was highly favoured. As YHWH’s Ebed she should have paid attention. In that case, there would have been much to see constantly, especially in relation to Elohim's dealings. However, with open ears the majority of the people generally remained inaccessible. In the First century, the climax came with the rejection of their Messiah. Therefore, Israel’s position as YHWH's Ebed in the End times can only be the result of sheer unmerited favour. As we saw above in Is 41:9 >> You are my servant, I have chosen you and not cast you away. In Romans chapter 11 Saul of the tribe Benjamin explains that principle in detail (11:1-2). Until the rapture of the heavenly part of Elohim's Israel, the earthly congregation remains in her state of blindness (11:25-27), shut up in disobedience (11:30-32). Elohim will love again his Ebed nation. Meanwhile their confinement in disobedience has served its purpose, the fullness of the Gentiles could come in. Behind this act of YHWH Elohim's a depth of wisdom is hidden, hard to fathom for us humans (11:33-36). Bring forth the blind people who have eyes, and the deaf who have ears. Let all the nations be gathered together, and let the peoples be assembled: Who among them can declare this, and show us former things? let them bring their witnesses, that they may be justified; or let them hear, and say, It is truth. You are my witnesses, says Yahweh, and my servant whom I have chosen; that you may know and believe me, and understand that I am he: before me there was no God formed, neither shall there be after me. I, even I, am Yahweh; and besides me there is no saviour. Here the Ebed of the book Isaiah, the true Jewish Remnant, appears as the collective Servant of witnesses. In that capacity they are prophetically called to testify in favour of their God, YHWH Elohim, during the forthcoming universal trial of the "last days". In view of that task their eyes, that times long were blinded, will be opened and so it will be with their ears that were deaf so long for YHWH’s truths. Then that faithful Ebed-body will be in the position to testify that all the things that happened to them during the many centuries - all misery, all suffering and mental despair - exactly proved to be what their God Yahweh had announced far in advance. All other so called ‘gods’ are definitely proven unable to match the true God only slightly in that weighty matter. After thousands of years only YHWH, the Elohim of Israel, turns out to be the only One who can utter true prophesies which, at their appointed times, come to their fulfilment. During the ‘trial’ all the other ‘gods’ fail miserably in that respect in front of their own supporters among the nations. Then, for example, it will turn out that the sufferings of Israel throughout the ages, which (temporarily) reached their climax with the Holocaust and its 6 million victims, were already outlined in the sufferings of my ebed Job (Job 1:8; 2:3). The drama of Job has become the tragedy of the people of Israel. For that reason, but also because Elohim himself called him regularly "my servant Job", his life provides an additional angle to precisely distinguish the identity of the Slave. But just as Job repented "in dust and ashes" and thereafter was restored to his former dignity, even receiving twice as much, so too the faithful part of Israel in time will be able to testify that it happened to them exactly that way (Job 42:6-10). 1. The age-old suffering for Israel was already outlined in the sufferings of Job. 2. The way his personal tragedy ended was a preview to Israel's future restoration. 3. Jobs "outcome" helps us to ascertain with even more sureness the identity of the Slave of Matth 24:45-47, as well as of the Isaiah-Ebed; at the same time gaining more understanding of his important role during the parousia, Yeshua’s presence. Job could not understand why he - none like him in the earth, a man blameless and upright, one revering God and turning aside from evil - had to go through so much suffering. To get confirmed his own righteousness - justifying himself rather than God - he came regularly in a dangerous situation, almost charging Elohim guilty of his trials and tribulations, yes, even of unfair trading. See, for example Job 27:2; 32:2; 33:8-13. But with the help of Elihu, the son of Barachel, the Buzite, and of course by YHWH himself, speaking to him from a storm, Job came to his senses, repented and gained really insight. Whether he also understood that Elohim allows just the ‘very best’ he has on earth being tested to the limit by Satan, we do not know. In any case, Job repented "in dust and ashes" and was then restored to his former dignity, receiving double the things he had lost. Compare Isaiah 40:1-2. In time, the faithful part of Israel shall be able to testify that she likewise went through the same experiences (Isaiah 61:6-7). Listen, islands, to me; and listen, you peoples, from far: Yahweh has called me from the womb; from the bowels of my mother has he made mention of my name, and he has made my mouth like a sharp sword. In the shadow of his hand has he hid me, and he has made me a polished shaft; in his quiver has he kept me close, and he said to me, You are my servant, Israel, in whom I will be glorified. But I said, I have labored in vain, I have spent my strength for nothing and vanity; yet surely the justice due to me is with Yahweh, and my recompense with my God. Now says Yahweh who formed me from the womb to be his servant, to bring Jacob again to him, and that Israel be gathered to him - for I am honorable in the eyes of Yahweh, and my God is become my strength -yes, he says, It is too light a thing that you should be my servant to raise up the tribes of Jacob, and to restore the preserved of Israel; I will also give you for a light to the Gentiles, that you may be my salvation to the end of the earth. Thus says Yahweh, the Redeemer of Israel, and his Holy One, to him whom man despises, to him whom the nation abhors, to a servant of rulers: Kings shall see and arise; princes, and they shall worship; because of Yahweh who is faithful, even the Holy One of Israel, who has chosen you. This prophecy concerning the Ebed in Isaiah fascinates in particular, because it is described within a frame of the nation of Israel as a collective, but at the same time also in the person of her Messiah. But again, as was already indicated: the Messiah is the primary, the number One among his people. 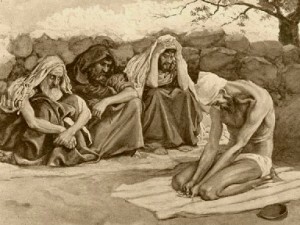 While Israel is directly addressed in verse 3 - You are my servant, Israel, in whom I will be glorified – yet in the verses 5 and 6 YHWH’s Ebed is marked as distinct of the nation itself: Yahweh who formed me from the womb to be his servant, to bring Jacob again to him, and that Israel be gathered to him… It is too light a thing that you should be my servant to raise up the tribes of Jacob, and to restore the preserved of Israel. Obviously, he is primarily holding the Ebed-position, and as such he will in due course, after the rapture of his own (Christian) Congregation, re-erect Jacob's twelve tribes to full recovery. And all this is entirely appropriate, inasmuch as Israel could not in its restored state act as YHWH’s Ebed in the earth apart from identification with Yeshua himself as their Messiah, because of his sacrificial and redemptive work accomplished in 33 AD at Calvary. However, here, and further expounded in chapter 53, we have to point out the malignant attitude of his own ‘Ebed’-brothers, constituting the majority of Israel. While he is dear to his heavenly Father himself, honourable in his eyes, being the One through whom YHWH Elohim becomes the Redeemer of Israel (verses 5 and 7), by the nation Israel itself he is the despised in soul, completely abhorred by them (verse 7). 1.) The secured ones of Israel will be restored to their Elohim by his Foremost Ebed, his dearest Son. It is true that they still have to go through the Great Tribulation, but from that event, Jacob’s trouble, they will emerge as saved people. Just as YHWH’s ebed Job was set up right by Elihu, informing him about the relationship with God that was appropriate for him, Messiah Yeshua shall raise up the preserved of Israel to full restoration. For the fulfilment of that part of his Father’s purpose, he like no other is in the excellent position. Why? Fully compliant with the prophecy in Genesis 3:15, during his ministry on earth, he turned out being primarily object of enmity - the meaning of the name Job - of the Devil. Like him, there was absolutely nobody on earth; however, he too had his Eliphaz, Bildad and Zophar. Kings shall shut their mouths at him: for that which had not been told them shall they see; and that which they had not heard shall they understand. How great the change of attitude from that of the present time! How startling will be the revelation of the Lord of glory in a world that has lain in darkness, superstition and alienation from God! The cause lay with Israel. They – not the prophet – are the mourning and repentant speakers in what follows in Chapter 53. They acknowledge with lamentation their unbelief. As a nation they had refused to believe the message proclaimed to them. Therefore, in the concluding part of this Study, the most impressive chapter about YHWH Elohim's Foremost Ebed, the One who is the real Self of Israel. Who has believed our message? and to whom has the arm of Yahweh been revealed? For he grew up before him as a tender plant, and as a root out of a dry ground: he has no form nor comeliness; and when we see him, there is no beauty that we should desire him. He was despised, and rejected by men; a man of suffering, and acquainted with disease: and as one from whom men hide their face he was despised; and we didn’t respect him. Surely he has borne our sickness, and carried our suffering; yet we considered him plagued, struck by God, and afflicted. But he was pierced for our transgressions, he was crushed for our iniquities; the punishment that brought our peace was on him; and by his wounds we are healed. All we like sheep have gone astray; everyone has turned to his own way; and Yahweh has laid on him the iniquity of us all. He was oppressed, yet when he was afflicted he didn’t open his mouth; as a lamb that is led to the slaughter, and as a sheep that before its shearers is mute, so he didn’t open his mouth. By oppression and judgment he was taken away; and as for his generation, who among them considered that he was cut off out of the land of the living for the disobedience of my people to whom the stroke was due? They made his grave with the wicked, and with a rich man in his death; although he had done no violence, neither was any deceit in his mouth. Yet it pleased Yahweh to bruise him; he has put him to grief: when you shall make his soul an offering for sin, he shall see his seed, he shall prolong his days, and the pleasure of Yahweh shall prosper in his hand. He shall see of the travail of his soul, and shall be satisfied: by the knowledge of himself shall my righteous servant justify many; and he shall bear their iniquities. Therefore will I divide him a portion with the great, and he shall divide the spoil with the strong; because he poured out his soul to death, and was numbered with the transgressors: yet he bore the sin of many, and made intercession for the transgressors. could take a slave’s form and came to be in the likeness of man, thus getting in the position to sacrifice his own soul and, along that road, providing the precious ransom for redemption of the Adamitic man. Or, as Isaiah prophesied above: he poured out his soul to death, boring the sin of many. In the Introduction of this Study we stated that the appearance of the faithful and discreet slave whom his master appointed over his domestics – the Ebed YHWH in the Isaiah prophecies - will take place at the parousia or the presence of Messiah Yeshua. However, what is meant by that Greek expression parousia? We refer to a commentary which the well-known lexicographer William E. Vine provided on the Greek text of One Thessalonians 2:19, where the Greek word appears for the first time in the letters written by the apostle Paul. Addressing the called members of Yeshua’s own Congregational Body he wrote: For what is our hope, or joy, or crown of rejoicing? Isn’t it even you, before our Lord Yeshua at his parousia? Parousia, lit., as marg. "presence." Parousia, here rendered "coming", is a noun formed from the verb pareimi = to be present, as in Luke 13:1; John 11:28; Acts 10:33, etc., and hence = "a being present with". In a papyrus document it is used of a royal visit to a certain district; in another, a person states that the care of her property demands her "presence" in a certain city. In Philippians 2:12 Paul speaks of his parousia, his "presence", at Philippi, in contrast with his apousia, his "absence", from that city. Always, wherever it occurs, parousia refers to a period of time more or less extended. eisodos, 13:24; the difference being that whereas these words fix the attention on the journey to, and the arrival at, a place, parousia fixes it on the stay which follows on the arrival there. It would preferable therefore to transliterate the word rather than translate it, that is to use "parousia", rather than "coming", wherever the reference is to the Lord Yeshua. Where parousia is used of the Lord Yeshua it refers to a defined period. Thus in 2 Peter 1:16 it describes, not the daily and general companying of the Lord with his disciples among the people, but that limited period during which he was transfigured before them, Matthew 17:1-8. Where it is used prophetically, parousia refers to a period beginning with the descent of the Lord from heaven into the air, 1 Thessalonians 4:16, 17, and ending with his revelation and manifestation to the world; see note on "with us", 2 Thessalonians 1:7. 1 Corinthians 4:1-5; 2 Corinthians 5:10. The presence there of the Thessalonian converts and their commendation by the Lord, would mean reward to the evangelists who had been the means of their conversion, and to the pastors and teachers who had laboured among them. For a similar thought see 1 John 2:28, and 1 Peter 5:1-4. There, too, all would be abundantly compensated for the afflictions they were enduring. The Parousia of the Lord Yeshua is thus a period with a beginning, a course and a conclusion. the conclusion in 2 Thessalonians 2:8; Matthew 24:27. · Paul, or his companions, 1 Corinthians 16:17; 2 Corinthians 7:6, 7; 10:10; Philippians 1:26; 2:12. © 2011 RMS.x95 - All rights reserved.